If you have a puppy you know that protecting your floors, your rugs, your furniture, every thing that puppy can reach is important. A puppy has a way of doing pee pee on every thing. I am extremely fortunate that my puppy has been housebroken in under four months. But I know I need a good supply of training pads on hand for one full year. And now that my puppy is a bit older I know his bladder its fuller and has the potential to pee much more than before. That’s why I was happy to hear that MedNet a leading manufacturer and supplier of training pads has introduced their new heavyweight SoftNit washable training pads. Medline Sofnit 200 Underpads in a Variety of Styles and Sizes. A mainstay in many facilities, this underpad is a more economical version of our Sofnit 300 pad, designed with a good combination of durability and economy. A lighter weight cotton/poly face fabric of Twill offers good stain resistance and high heat resistance during drying. The total weight of the pad is lower than many other styles, resulting in lower processing costs. 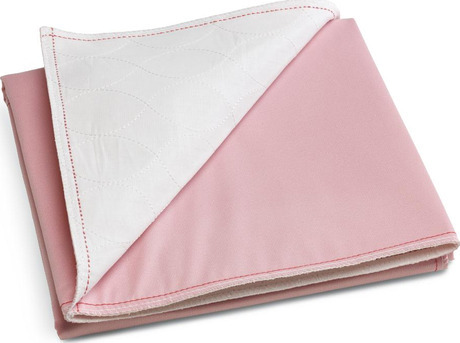 Pink Vintex barrier is extremely durable.